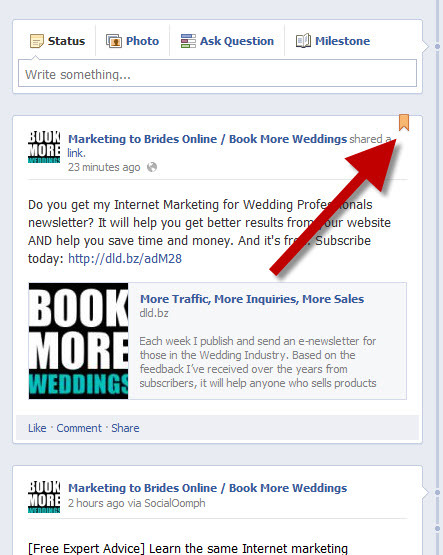 Did you know you can “pin” a post on your Facebook business page so that it always appears as the first post at the TOP of your timeline? This is a new feature and additional functionality with the Facebook Timeline format. It’s simple to do and here’s how you do it. 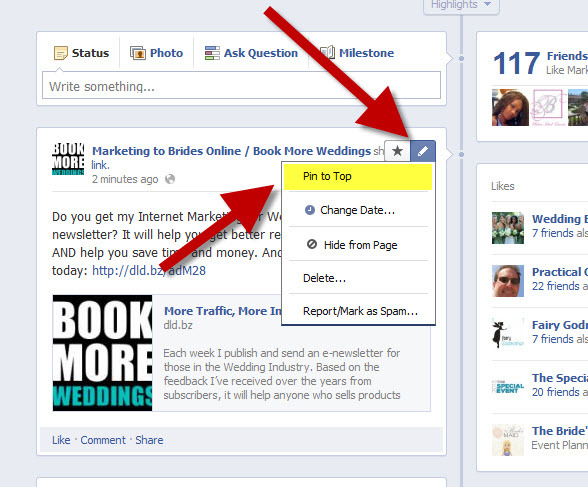 3) Select the Facebook post you want “pinned” to the top of your status updates. Pinning a post means it will always appear at the top of your Facebook wall. 4) Activate the editing function by putting your mouse over the right-top corner of the post you want to pin – you’ll see a little pencil show up. The post you just edited will now ALWAYS show up as the first post on your Facebook wall. If you’ve done this successfully you will see a small folded-over gold ribbon on the top right of that post (see second image below). give it a Google+ vote. Thanks!